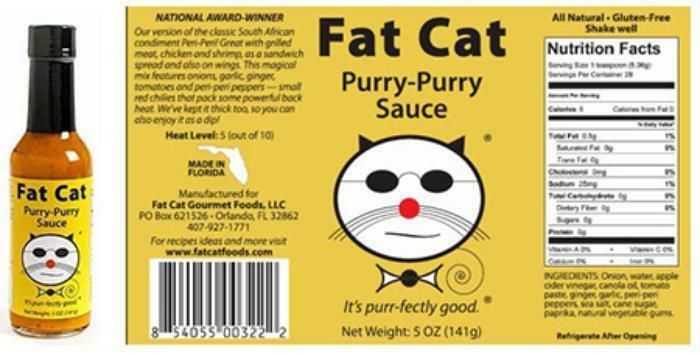 United Natural Foods, Incorporated (UNFI) is recalling a single production batch of Fat Cat Purry-Purry Sauce Hot Sauce. The recalled product was distributed exclusively to Winn-Dixie Supermarkets, BI-LO Supermarkets and Harvey’s Supermarkets (464 stores in all) in Florida, Georgia, South Carolina, North Carolina and Louisiana specifically. Fat Cat Purry-Purry Sauce Hot Sauce comes in a 5-oz. glass bottle whose necks display the lot number FCPPMAY092019. Customers who purchased the recalled product return it to the place of purchase for a full refund. Consumers with questions may contact the company at 407-927-1771, Monday to Friday, from 9am – 4pm (EST).